Shabbat Shalom, my friends! 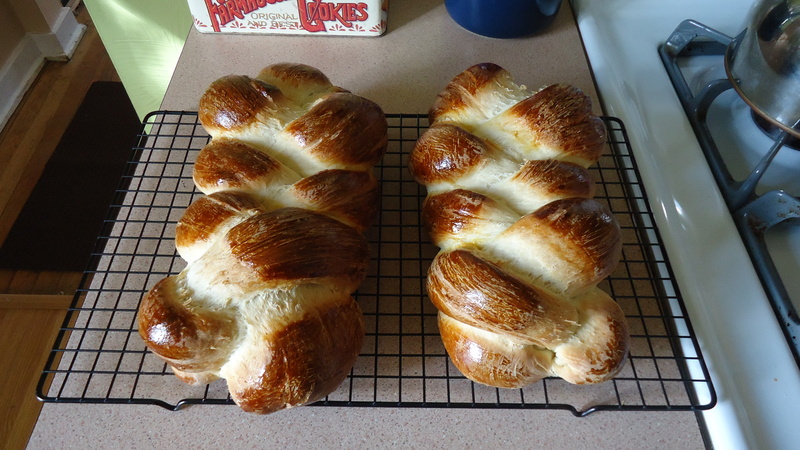 Let’s continue our adventures in interfaith baking with challah, the traditional braided bread of Shabbat. This recipe is a labor-intensive, yet rewarding pursuit that yields two challot. It requires a commitment to several minutes of kneading, then a few hours of patience as the dough rises, rests, and rises again. Mike is a Reform Jew, and we do not follow kashrut, or dietary laws, which include never mixing meat and dairy in the same meal. I am no kashrut expert, but those following kashrut would not serve bread made with milk and butter with a meat meal; I have read that this recipe can be converted to pareve, or neutral, by using water and pareve margarine. Lightly grease a large bowl; set aside. In a mixing bowl, combine yeast with two cups flour. In a medium saucepan, combine milk, butter, sugar, and salt. Heat until just warm, and butter is almost melted. Pour milk mixture into flour mixture, then add eggs. Beat on medium speed for 30 seconds, then scrape the sides of the bowl and beat on high speed for three minutes. Remove mixing bowl from mixer stand; add two additional cups of flour, one cup at a time, and stir with a wooden spoon until well-combined. Turn dough onto a lightly floured surface and measure out 1 additional cup of flour to incorporate as you knead the dough. You may need as little as an additional half-cup, or as much as the whole cup, depending on the texture of your dough. Knead for 6-8 minutes, until dough is smooth and elastic. Place dough in greased bowl and turn over to coat both sides. Let rise in a warm place until doubled in size, about 1 hour. Punch dough down and turn out onto a lightly floured surface. Divide into six even portions and let rest for 10 minutes. Roll each portion of dough into an 18-inch rope and place individual ropes on a baking sheet. Braid two sets of three ropes together to form two separate loaves; be sure to tuck in the ends so they don’t come apart. Cover and let rise for 30 minutes. Brush loaves with egg yolk. Bake for 25-30 minutes, until the loaves sound hollow when tapped. Do you ever make french toast with your challah? I remember some tasty breakfasts at Metro 29 diner in Arlington made with challah bread. Indeed, challah makes the best French toast! We actually just had it yesterday morning.